Commodore 64 Car Pilot 1984 – Worlds First Consumer GPS? 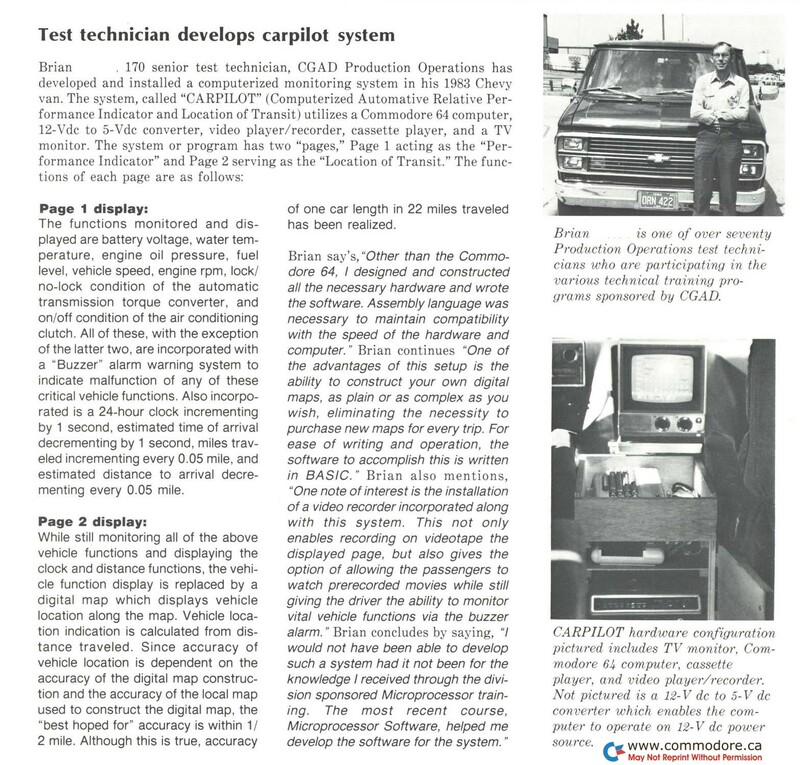 Below is an article from 1984 explaining how a company named CGAD Production Operations produced and tested what might be the worlds first civilian automotive Global Positioning System (GPS). This product was way before its time and would have been a landmark achievement in consumer electronics. 1974 The branches of the military, after having worked on a GPS system for the past 11 years, launch the first satellite of a proposed 24-satellite GPS system called NAVSTAR. The satellite, and many to follow, are meant to test the NAVSTAR concept. 1978-1985 The military launches 11 more test satellites into space to test the NAVSTAR system, which by then was called simply “the GPS System”. The satellites carried atomic clocks with them, to more precisely measure transmission times. Some of these satellites (starting in 1980) carried sensors designed to detect the launch or detonation of nuclear devices. 1983 Shortly after the Russians shot down Korean Air flight 007 after it wandered off course into Soviet airspace over the Kamchatka Peninsula, president Reagan offered to let all civilian commercial aircraft use the GPS system (once it was completed) to improve navigation and air safety. I don’t know who sent this to me, but thanks! We can find no other information on this product or this company (other than it might be related to a Rockwell product named CGAD), so if you have any other information on this, please write us a comment below. The functions monitored and displayed are battery voltage, water temperature, engine oil pressure, fuel level, vehicle speed, engine rpm, lock/ no-lock condition of the automatic transmission torque converter, and on/off condition of the air conditioning clutch. All of these, with the exception of the latter two, are incorporated with a “Buzzer” alarm warning system to indicate malfunction of any of these critical vehicle functions. Also incorporated is a 24-hour clock incrementing by 1 second, estimated time of arrival decrementing by 1 second, miles traveled incrementing every 0.05 mile, and estimated distance to arrival decrementing every 0.05 mile. While still monitoring all of the above vehicle functions and displaying the clock and distance functions, the vehicle function display is replaced by a digital map which displays vehicle location along the map. Vehicle location indication is calculated from distance traveled. Since accuracy of vehicle location is dependent on the accuracy of the digital map construction and the accuracy of the local map used to construct the digital map, the “best hoped for” accuracy is within 1/ 2 mile. Although this is true, accuracy of one car length in 22 miles traveled has been realized.